Induk KUD from Indonesia became an Associate Member of the ICA on 26 October 2011. Induk KUD was founded on 12 November 1979 and serves as the national federation of rural co-operatives in Indonesia. Induk KUD's mission is to help the co-operative movement expand joint business relationships, ensure creation and implementation of a business climate that supports co-operative survival and development, education and training, develop co-operative business, and improve the welfare of its members and as a result the community. With growing economy, demands has became more than the world could cover and started to exceed the natural capacity of planet. While global economy has increasing 7 times in last 50 years, natural life system and habitat have remained principally same. As federation and congress, we wish to contribute to improving agricultural productivity and raising efficient usage of resources and assets. It would be an honor for Organizing Committee to invite you to ‘’2nd International Congress of Agriculture and Food’’ to contribute the efforts for agricultural development. Rome, October 15th, 2013 – The United Nations Food and Agriculture Organisation (FAO) and the International Co-operatives Alliance begin a new collaboration with the shared conviction that agricultural and food co-operatives must be central to any agricultural and rural development strategy. 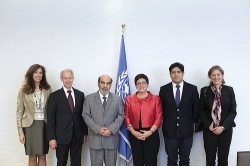 A Memorandum of Understanding that underlines this idea was signed today at FAO Headquarters by FAO Director-General José Graziano da Silva and Alliance President Pauline Green. 35 Case studies highlighting good practices in building innovative rural institutions to increase food security, and the positive contribution of co-operatives in this. La Organización Internacional de Cooperativas Pesqueras (ICFO) está impulsando a los gobiernos a establecer cooperativas pesqueras y proteger los derechos de los pescadores. L'Organisation internationale des coopératives de pêche (ICFO pour son sigle en anglais) exhorte les gouvernements à établir des coopératives de pêche et à protéger les droits des pêcheurs. The International Co-operative Fisheries Organisation (ICFO) is urging governments to establish fisheries co-operatives and safeguard the rights of fishers. Más de 500 representantes de todo el mundo del sector cooperativo pesquero se reunieron en Indonesia para celebrar el tercer Día Mundial de las Cooperativas Pesqueras.